The conventional approach to identity management has become too complicated. These days there are so many moving parts and partial solutions that it can be overwhelming for IT organizations to stitch together something that works. That is why the concept of having One Directory to Rule Them All® is so appealing for IT admins. 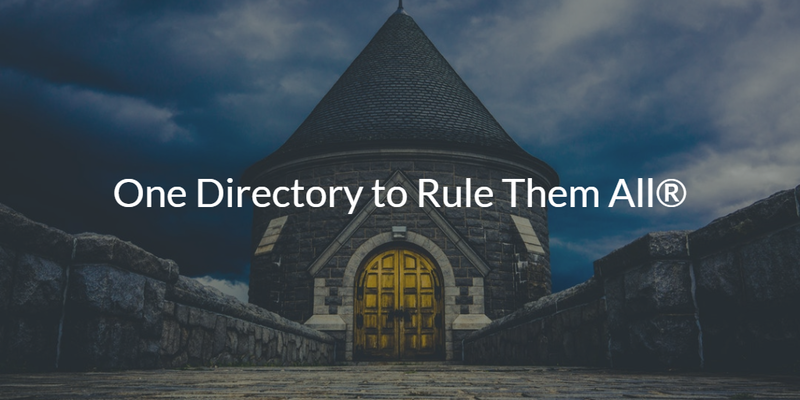 It is easy to list the advantages of having One Directory to Rule Them All, especially when you consider that the alternative is typically a hodgepodge of add-on solutions layered on top of antiquated on-prem identity providers like Microsoft® Active Directory® (AD). So let’s discuss how we’ve reached this current state of decentralized identity management and why IT organizations need One Directory to Rule Them All. The concept of the directory service has been around for decades. At first, in the era of Identity-as-a-Service (IDaaS) and cloud identity and access management (CIAM), the idea of a directory service seems antiquated. In fact, the most common directory services are antiquated. Most IT admins think of either AD or OpenLDAP™ when they hear the term ‘directory service’. AD and OpenLDAP were both developed in a different era of IT. This era was characterized by on-prem IT networks and predominantly homogeneous system environments (e.g., Windows®). While both of these solutions have been great for these types of environments, IT networks haven’t worked that way in a long time. For example, cross platform system environments (e.g., Windows, Mac, and Linux) are common today. As are web applications like Salesforce, cloud infrastructure like AWS, and more. While the changes brought about by these new innovations and solutions have been largely positive, the challenge is that IT management tools are still firmly grounded on-prem with AD and OpenLDAP. IT admins are well aware of this challenge and have been since the mid-2000’s. In fact, an entire generation of Identity-as-a-Service (a.k.a. web application SSO) solutions were created to mitigate the limitations of legacy IdPs. Web app SSO solutions are effectively add-ons to the on-prem IdP. Their purpose is to provide capabilities the legacy management system lacks. While this approach can be effective, any IT admin will tell you that it is far from ideal. As the IT environment has shifted to include web applications, cloud infrastructure, Mac and Linux devices, and much more – AD and OpenLDAP have been able to manage less and less. IT organizations cannot continue to layer add-on solutions on top of their on-prem IdP indefinitely. This is why IT admins are interested in having One Directory to Rule Them All. Fortunately, having One Directory to Rule Them All is achievable with a next generation CIAM solution called JumpCloud Directory-as-a-Service®. Check out our whiteboard presentation to learn more about cloud IAM protocols and architecture. JumpCloud Directory-as-a-Service is Active Directory and LDAP reimagined. 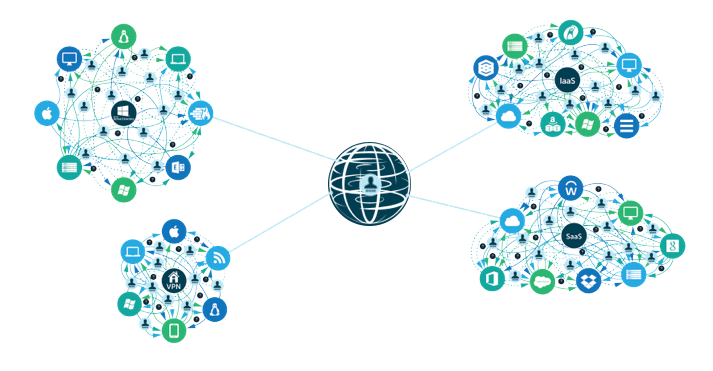 This next generation CIAM platform securely manages and connects users to their systems, applications, files, and networks. Through its diverse support of platforms, protocols, and providers, JumpCloud centrally manages user access to virtually any system (including Windows, Mac, and Linux), cloud or legacy applications (Salesforce, JIRA), wired or WiFi networks and infrastructure (RADIUS), and physical or virtual file storage (Samba, Dropbox), for example. 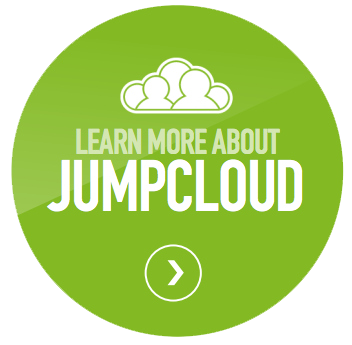 In essence, the JumpCloud platform provides One Directory to Rule Them All. Contact the JumpCloud team , or sign up for a Directory-as-a-Service account today to discover the benefits of having One Directory to Rule Them All. Your first ten users are free forever to help you explore the full functionality of our platform at no cost to your organization. We don’t even require a credit card to sign up!